The camera silently glides across a row of glass panes. Piercing sunlight dances across these surfaces, accentuating layers of dirt and the passage of time. Glimpses of an overgrowing garden punctuate the grimy, clear and empty panes, traversing between two monitors, with a small gap in between. You quickly realise that, rather than being a smooth transition, the fluidity between monitors is a surface illusion; doubt creeps in as the images loop and fragment. This arrangement of glass, initially so stable, is revealed as a construct; it is a device that blurs the boundaries between material and perception. Niamh O’Malley’s video work Glasshouse (2014), which the show’s title originates from, is a lucid reflection of her first major UK solo exhibition at Bluecoat. 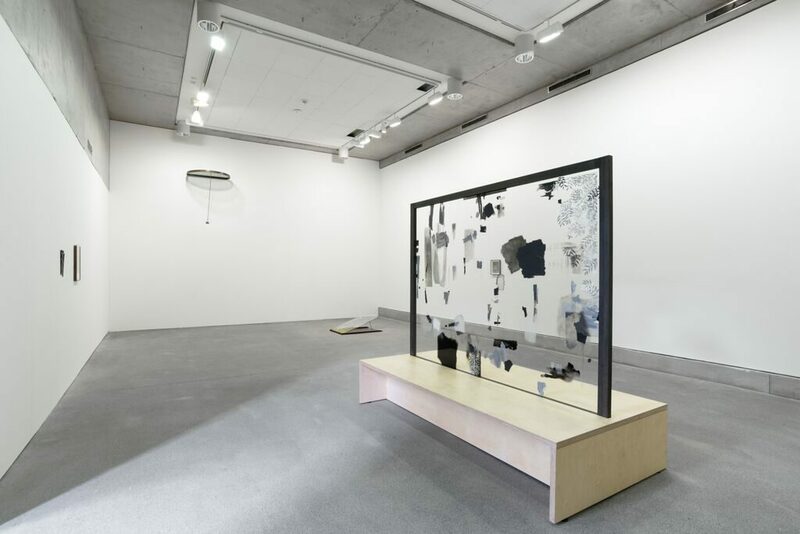 Encompassing video, painting, sculpture, drawing and printmaking, the exhibition explores O’Malley’s interest in constructing images, primarily using the material and spatial properties of glass. Quarry (2011) is a geological study of a working Irish limestone quarry. In the looped film, O’Malley distorts space and scale to create new cinematic images of the sedimentary rock. Opaque glass obscures the lens, and our perspective, before being methodically pulled away. Michael Carter acknowledged that the frame mediates the spectatorship experience by demarcating the boundaries between real and represented space. O’Malley is highly aware of this, skillfully manipulating the boundaries between abstraction and figuration. The addition of a black projection screen drinks up the vibrancy of the film, further dramatizing the motion of the sliding lens while establishing a new space between site, camera and viewer. It is captivating. Sculptural installation Window (2013), originally commissioned by Project Arts Centre, dominates the second gallery space. Slipping between internal and external languages of display, the work consists of a large glass frame sunken into a wooden bench. Structurally, it’s reminiscent of functional aesthetic structures on transport networks or public realm commissions, albeit with Duchampian qualities. However, it’s undeniably a painterly work, a dialogue between the translucency of glass and the physicality of each mark. Drawing on her training as a painter, O’Malley has engaged in brinksmanship with each mark, an exchange that deliberately spills out into wider environments. It’s notable that anyone choosing to sit normally on the bench would be unable to view these marks; is this another act of layering? In a well-considered curatorial set piece, O’Malley’s video work Nephin (2014), a breathless circumnavigation of an Irish mountain shot from behind a car window, engages in spatial dialogue with Bluecoat’s glass and viscous concrete architecture. The freestanding monitor, and nearby tall beech frame, overlays the external gallery windows, creating a mise-en-scène that draws in the bustling Liverpool streets. Crucially, the black mark O’Malley painted on the car window, which pins the mountain as the Irish landscape blurs together in the film, still draws the eye within this composition. Glasshouse is a clinical exhibition which does justice to O’Malley’s artistic temperament and material interrogation. However, for an exhibition which asks the viewer to consider their own role in making and perceiving images, its polished finish is occasionally problematic. While works such as Quarry thrive by rupturing the hegemony of the artistic image, several works prove difficult to penetrate or establish a connection with, evoking the feeling of being left on the outside looking in. Jack Welsh is a researcher, writer and artist based in Liverpool.